Messy Easter acknowledges that we all live on the messy edges of life. 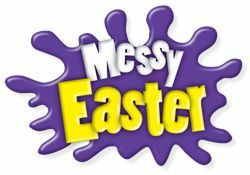 You won’t get physically messy, but will enjoy games, craft and other activities all based around Easter. You could make a resurrection scene using donuts or egg shells, decorate a cup, play minute to win it, make a donkey with clothes pegs, colour in a pretty Easter scene and make a fish balloon. We then gather in the church for a brief celebration service where you will hear the story of Easter, before convening back in the hall for an evening meal. Great for people of all ages and for parents to do with their kids.